Herbs and medicinal plants have been a part of folk medicine and culture for centuries. In our age of science and technology, it can be fascinating when old traditions can be proved valid through research. This is certainly the case with this natural healthy ingredient, nopal. You may know this ingredient as prickly pear cactus or nopales. Found naturally in the southwestern desert regions of the United States and Mexico, nopal has been used not only as a medicinal plant, but is also a staple in the Latin American diet. This plant has grown in popularity over the years, and some consider it a superfood. Regardless of its standing, the prickly pear health benefits are numerous and studies abound citing its benefits for everything from helping prevent ulcers to treatment of hangovers. However, what has many researchers excited is its possible healthy benefits for diabetes treatments. According to a study published in the "Journal of Ethnopharmacology," nopal caused a significant decrease in blood glucose values - nearly 18 percent. It was also discovered by Calzada Tecnologico in Baja California that adding nopal to traditional high-carbohydrate Mexican meals among patients with Type 2 diabetes induced a reduction in glucose concentration after the meal. It has also been shown to have a significant impact on cholesterol levels. In studies published in the "Journal of Nutrition" led by Dr. Maria L. Fernandez in California, it was found that prickly pear pectin decreased LDL concentrations and led to a 28 percent drop in total cholesterol levels. In addition, Mexican researchers have found that animals fed raw nopal had lower weight gains and a 34 percent reduction in LDL cholesterol levels. Overall studies have concluded that intake of nopales before meals may be useful in managing hyperlipidemia, diabetes related diseases, and obesity. For these reasons and more, you’ll find nopal as an ingredient in Jon Barron’s Glucotor v.2 formula. 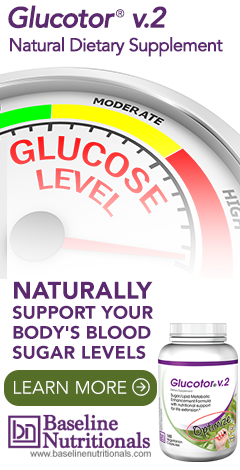 This formula helps your body naturally maintain healthy blood sugar levels and optimize glucose metabolism. Nopal may also be helpful as a weight loss aid. Since it is high in fiber, it can create a sense of being full, so it helps with overeating issues. It is low in saturated fat and cholesterol, but has a high metabolic activity, which maximizes the fat burning and food transformation to energy processes. You may have seen prickly pear lollipops promoted to help aid weight loss. You can also find it as an ingredient in Jon Barron’s Private Reserve Superfood formula. When you take a closer look at what’s actually inside nopal, you may not be too surprised at its health benefits. The plant is high in fiber as well as being a good source of antioxidants and carotenoids. In addition, it has a high mineral content including minerals like calcium, potassium, magnesium and phosphorus. And it is considered to have antiviral, anti-inflammatory, and anti-clotting properties. You’ll find prickly pear cactus in candies, jellies, jams, syrups, juice, and even alcohol. To use as a cooking ingredient, you’ll likely find it in grocery stores with a well-stocked international cuisine sectuib. Since the texture is similar to that of a cooked green bean or green pepper, you’ll find it in Mexican cuisine that features meat and vegetables, egg dishes, and steak stir fries. You can also find it in supplement form as an oil or capsule. Learn more about lowering blood sugar and preventing diabetes. Everything is a superfood if they can make a buck off of it. It's just food, real food, something we hardly do anymore.